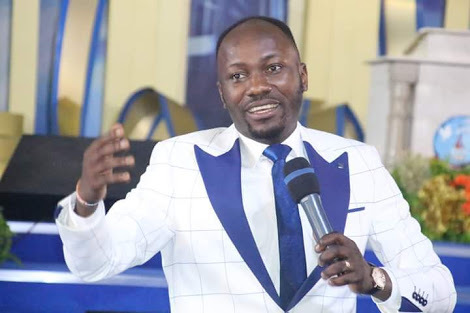 The senior pastor of Omega Fire Ministries Worldwide, Apostle Johnson Suleman has yet again survived an attempt on his life. He made the revelation during the May 2018 miracle and fire night held at the headquarters church in Auchi, Edo State Nigeria. He said after a while, he walked up to the lady again to ask her if his flight is boarding and the lady told him that the flight is not boarding and that she will inform him when the gate for boarding is opened. Nevertheless, after about 30 minutes, he asked the lady if the flight is boarding and the lady told him that it is not yet time. The man of God said he checked his time and it was already 11.30 am and he decided to go to the boarding gate to find out what is happening only for him to be told that the flight has departed. Apostle Johnson Suleman wasn't happy to hear that he missed his fight after getting to the airport two hours before departure. He called his wife to inform her about what happened and the wife told him that "For you to miss your flight, it is for a purpose"
Papa, as he is fondly called, said he tried to see if he could get another flight to Nigeria that friday but to no avail. However, he said on Sunday a security personnel came to his office and told him that they rounded up some boys who were busy confessing that on Friday they were waiting for him in a hiace buses along Benin Auchi Road, fully armed and their mission was to open fire on his car. He said he was moved to tears when the security personnel was talking and all he could do was to go on his kneels and thank God. The man of God pointed out that an insider must have told the armed men his itinerary and he concluded by saying that "You See Me, I No Dey Fear. I don't get careful or get worried, I just stay connected."